2014 / The 5th annual conference on art theory organised by the AVU Academic Research Centre on 4 December 2014 at the lecture theatre of the Academy of Fine Arts in Prague (U Akademie 4). 2013 / A conference reflecting on transformations in artistic practice in the post-media situation. 2012 / A symposium on the occasion of the exhibition Islands of Resistance: Between the First and Second Modernity 1985–2012. 2011 / A conference reflecting on the historical legacy of conceptualism of the 1960s and 70s in current art theory and practice. 2010 / A conference devoted to theoretical rejection and critical evaluation of the current relationship between cultural institutions mediating contemporary art, the public and the state. 2008 / Symposium dedicated to critical reflection on anthologies. 2005 / A discussion on the figure of Alen Divis was organised as one of the accompanying programmes to Divis’s retrospective exhibition (Rudolfinum Gallery, Prague, 10 February–24 April 2005). 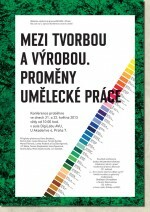 Mikulas Medek - Closed Issue or Current Phenomenon of Czech Art? 2002 / A one-day international symposium on the work and figure of Mikulas Medek was organised by the AVU Research Centre in Prague in co-operation with the Rudolfinum Gallery as one of the accompanying programmes to Medek’s retrospective exhibition (Rudolfinum Gallery, 25 April–18 August 2002). 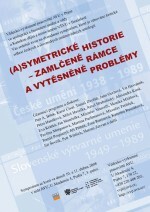 1999 / A two-day international symposium on the history and impulses of Czech post-war art.